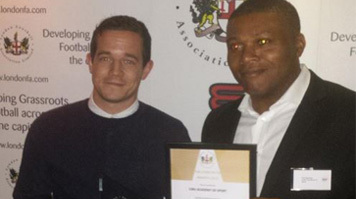 London South Bank University's (LSBU) Academy of Sport has won the Recreational Football Partner of the Year award at the London Football Association Awards for its exceptional work in engaging the community though sport. The tenth annual London Football Association Awards ceremony was held at the home of English football, Wembley stadium, last week and recognised the great work of London grassroots clubs, volunteers and their key partners. This latest win follows a string of achievements that the Academy has gained this year. It was honoured by the YMCA for its vocational course delivery and has won the Inclusive Fitness Initiative Award for work in increasing participation of sport and exercise amongst people with disabilities. The Academy of Sport uniquely combines academic and non-academic functions through sport facilities, taught courses, research units, sports science support services and sport development. One the Academy’s most recent successes includes the huge contribution it has made to the growth of Futsal – five-a-side football mainly played on a smaller field. Over the past year, the Academy of Sport has hosted three Female Futsal Festivals at the university. These festivals have seen over 100 new female participants to the game and many are now representing the university in its new Women’s Futsal team. Most recently, the Academy has hosted a Level One Futsal Coaching course, helping to qualify 12 new Futsal coaches, many of which are LSBU students.